Commutation— The change in current that takes place in the armature, when passing from the influence of one pole to the next, is known as commutation. when any two segments of the commutator come in contact with a brush at a time, then the short circuit is caused between two armature coils. the short-circuiting gives a sudden rise to armature current in reverse direction and produces sparking at the process. 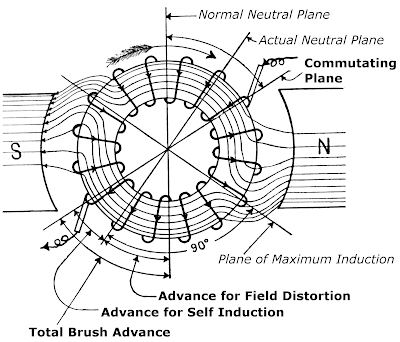 Figure 28(a) shows the armature coil B just to go for communication while the commutator is rotating in an anticlockwise direction, The e.m.f. 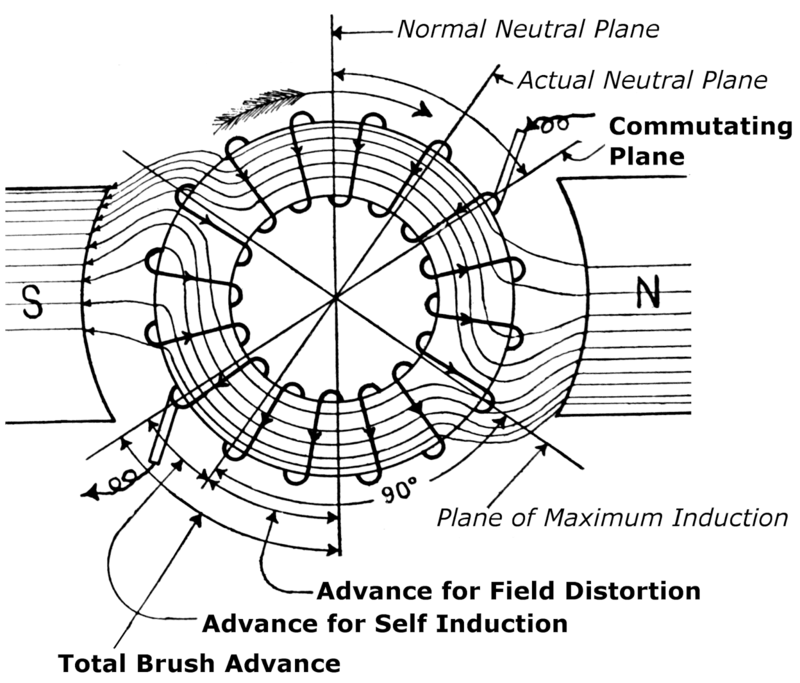 induced In coils A and B are being delivered to the brushes and the directions of currents are also from A and B to the brushes. When the segment a and b are short-circuited by the brush, Then the coil B short-circuited (see figure 28) and the direction of current becomes from A to a, a to B and B to b. In this way, The direction of current through coil B is changed, (formerly it was from B to a). In a short while, the segments c comes in contact with the brush and the short circuit of segments a and b is removed. 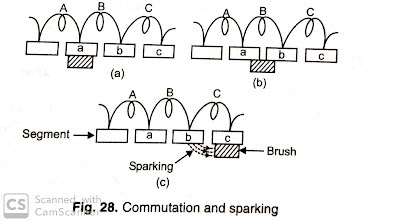 The current A-a-B-b tries to reach the brush and causes sparking, As shown in figure 28 (c). Interpoles are used to reduce the sparking, Which produce a sort of back e.m.f. and reduces the flow of rivers current, e.g. in coil B. 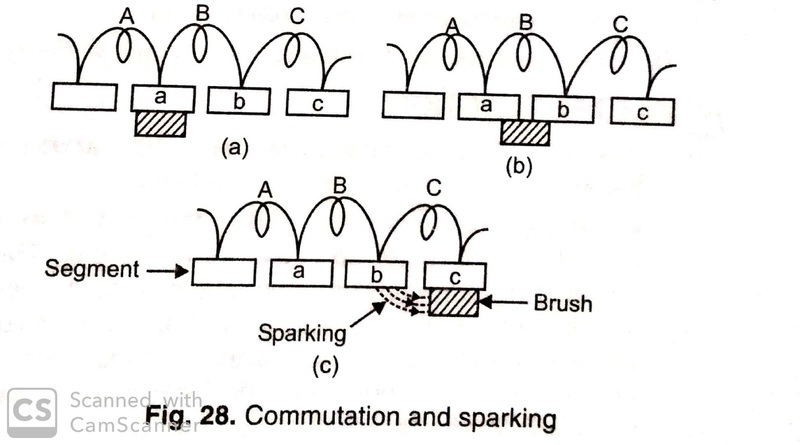 The Following Methods are Used to Obtain Commutation Without Causing Spark. Interpoles are placed Midway between the main poles in order to minimize the sparking. These are connected in series with the armature coil. With the use of Interpoles, The brushes need not be advanced in the direction of rotation. In this method, The width of the coil is kept lesser than the width of the field of a Pole. In this way, The armature coils remain sufficient apart from each other and may not cause short-circuiting. Hence, The sparking is reduced, throw the output e.m.f. is also reduced a little. The use of high resistance carbon brushes also reduces sparking. Graphite brushes have comparatively high resistance, of course, by using high resistance brushes, the output current is reduced but as an advantage, the sparking is also reduced to a great extent.